OK, so I Really Am working on losing weight and getting strong. But when you are working hard at meeting your goals, sometimes the very fact that you are not eating all the things you adore means that you think about everything that you are missing – All. The. Time! So, when I saw this book, I moaned…. and drooled…. Then I thought – well, if I do well during the week, I can enjoy ONE thing that is intensely bad for me. Just not in the OMG, I have to eat it All way that I had a habit of doing. Therefore, when this book showed up in my bookgorilla.com email, well, who can resist? I haven’t made anything from the book yet, but it is going on my reader! Throw moderation out the window. When you want that real homemade flavor, from-scratch frosted layer cakes, brownies that taste like brownies, and cookies that taste like the ones your grandma used to make, only real ingredients will do: real butter, real cream, real chocolate, and lots of it. That’s how Rosie’s has been baking its award-winning treats for over thirty years, and why the Rosie’s Bakery All-Butter, Fresh Cream, Sugar-Packed, No-Holds-Barred Baking Book won an IACP/Julia Child Cookbook Award. Now, that book and the follow-up—Rosie’s Bakery Chocolate-Packed, Jam-Filled, Butter-Rich, No-Holds-Barred Cookie Book—are back, updated, revised, and combined into one super recipe collection. 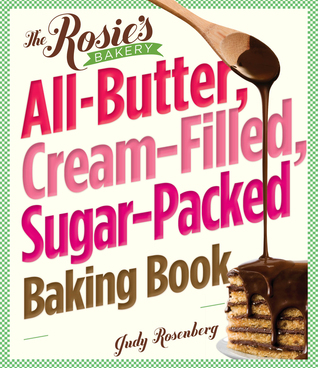 Packed with more than 300 irresistible recipes—more than 40 never before published—from Judy Rosenberg, owner of Rosie’s Bakery, the famous chain of New England bake shops that has won numerous Best of Boston awards, The Rosie’s Bakery All-Butter, Cream-Filled, Sugar-Packed Baking Book is for holidays, birthdays, pick-me-ups, the cookie jar, bake sales—when only genuine homemade goodness will do. Fabulous cakes and cupcakes: Lemon Coconut Layer Cake, Velvet Underground Cake, Chocolate Custard Sponge Roll, Sour Cherry Fudge Cake, Coconut Pecan Oatmeal Cake, Maya’s Little Butter Cupcakes, and Coconut Fluff Babycakes. Delectable cookies and bars: Pecan Crunchies, Fresh Ginger Crisps, Dagwoods, Honeypots, Noah Bedoahs. Plus the unspeakably delicious Chocolate Orgasms, and more. I hear you. My cholesterol numbers were well below not good on my last checkup, so I’ve had to change my diet. Unfortunately my definition of willpower is to not have it in the house. No potato chips, caramel corn, chocolate bars (except the ones that are so high in cocoa that they are like chocolate-flavored wax), no cookies, the list goes on. Sigh.